Winter running will give you a better workout. You will burn up to 12 percent more calories and 32 percent more fat as your body tries to maintain its temperature while running in cold weather and wearing extra clothing for protection. 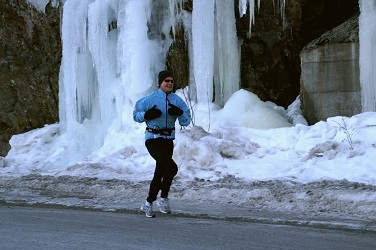 Running during the winter in the cold weather is the favorite running season for many runners. They don't have to deal with hot temperatures or humidity, which can be very uncomfortable. Being outdoors provides us with Vitamin D, which our bodies crave in the short days of winter helping those of us who suffer from seasonal affective disorder. Convincing yourself to go running in cold weather is sometimes the most difficult part. All runners attest to the fact that it is so enjoyable once you start running and get warm. Say good-bye to the winter blahs! There will be many winter days when running outdoors will be quite safe using reasonable caution. However, there will be times when common sense tells us to find another way to run or train. The conditions underfoot should be one of most important determining factors. If it is extremely icy and slippery or if the sidewalks are not clear and the streets too narrow with snow build-up, you should probably choose not to run outdoors. In extremely cold temperatures, i.e. -22°F(-30°C), you would be wiser to hit the treadmill or an indoor track. You don't want to risk hypothermia or frostbite. Both can be quite dangerous. Hypothermia occurs when your core body temperature drops below normal. The heat loss is greater than the amount the body can generate to maintain its core temperature. The core temperature must be maintained to keep the body's metabolism and normal body functions working. Mental confusion, shivering, slurred speech and clumsiness are all symptoms of hypothermia. If you or any of your running mates experience these conditions, immediately get to a warm, dry place and seek medical attention. Do not let the person affected fall asleep. Frostbite happens when skin is exposed to cold temperatures for a period of time. The body reacts by stopping the flow of blood to that area to protect the rest of the body. With no blood flowing to that area to keep it warm, it will begin to freeze and cause damage the skin and underlying tissues. It is more likely to happen in areas furthest away from the heart, such as hands, feet, nose and ears. Symptoms include white, pale skin with blotchy patches. The area will have numbness and possibly pain. Pressing on the area will leave an indentation rather than immediately springing back to shape as it normally would. Treatment for frostbite includes warming the area with warm water (not hot). The area will become red and you may experience tingling and pain as the area heals. You really want to avoid getting frostbite as the effects may be long lasting. It can create scars and circulation problems in the area. In more serious cases, gangrene can develop and amputation may be required. Seek medical attention as soon as possible for treatment. It is most important to dress appropriately for cold weather running. Your clothes should be warm, but not bulky. Dress in three layers - a base layer, a thermal or insulating layer and an outer windproof shell or a soft shell for those really cold weather days. Keep your head covered as much of your body's heat can be lost through the head. Wear a warm beanie or a balaclava. In cold weather gloves will not keep your hands as warm as mittens or convertibles as gloves separate the fingers and you will lose body heat. Trail running shoes or waterproof running shoes will help keep you safe and dry in slippery, wet conditions while winter running. A neck warmer can be used to protect your neck and your face and it helps warm the cold wind, making breathing easier. Neck warmers or neck gaiters have an added advantage over face masks as they can easily be removed if you become too warm. Make sure you don't dress too warmly as it will cause excess sweating resulting in your becoming chilled or cold due to the wet clothing. Before you start to run, you should be feeling a little chilly. You will soon warm as you start to run. 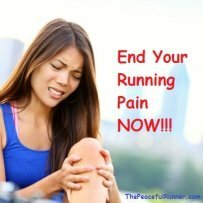 Dress for winter running - not winter walking! You should be dressed in layers with a base layer of wool if possible. Wool has the advantage of keeping you warm and dry in cold temperatures. Synthetics get wet and you will quickly feel cold when you stop running. When you are finished running in the cold weather, change your clothes as soon as possible. Your running clothes will be wet from sweat and you will get chilled easily. Have a change of clothes ready for after your run if necessary. The slippery and icy conditions that winter often brings may increase the risk of injury. You can make adjustments to reduce the risks. 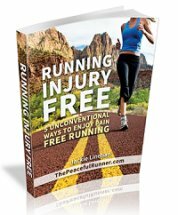 If you are nervous while running on slippery conditions, you will be tensing your muscles. 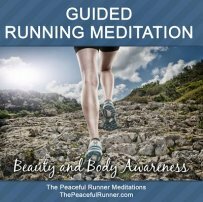 Learn how to relax your body while running. Even if you do fall, chances of you getting hurt are greatly reduced if you are relaxed. You may need to adjust the intensity of your workout and shorten your stride. Do hill training while running outdoors and keep the speed work indoors when surfaces are slippery. Slow down when changing direction or making a sharp turn to avoid slipping or pulling muscles that may not be warmed up. Overall the benefits of winter running greatly outweigh the risks. Winter running builds character. Just knowing that the cold weather can't stop you from training will greatly increase your confidence and help you maintain your running fitness for the spring. The winter months can be so long and depressing without an enjoyable activity. 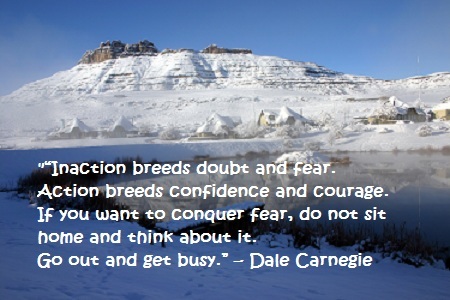 Change how you think about winter. Go winter running and learn to love winter and the cold weather again.